The St. Regis Aspen Resort is located at the base of Colorados legendary Aspen Mountain and one block from the gondola plaza. The resort is also steps from downtown Aspen parks, shopping, dining, hiking and biking trails and nightlife. Aspen exudes unique historic charm while still providing all the conveniences and excitement of a large city. 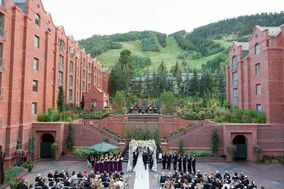 This is the perfect mountain setting for a Colorado destination wedding. The resort is 4 miles from Aspen Pitkin County airport (ASE), our guests enjoy complimentary transportation from the public airport. Located on our lower level and housing up to 600 guests, the ballroom is saturated in refined champagne hues. Sconces light the fabric-paneled walls while six chandeliers create an enchanted setting. For more intimate weddings, the room divides into two salons, creating the perfect atmosphere for your guests. Please contact the resort directly to explore all of our event spaces. Our Executive Chef will personally consult with the bride and groom to create a bespoke menu to tempt the palate. From impressive canapés and dramatic dinners to artistic wedding cakes, we offer unique menus and custom creations that will leave a lasting impression. Request an appointment with a St. Regis Specialist and explore exceptional rates for your friends and family at The St. Regis Aspen Resort. From custom flower arrangements to room décor to accommodations for your guests, our specialists will assure that each need is flawlessly met. We look forward to creating indelible memories for you to share. Contact a St. Regis wedding specialist at 970 920 3300 or request for more information online.